Anerien’s son was just three years old - when she was diagnosed with the devastating Hodgkins Lymphoma. BACKGROUND: Anerien Smit is the 27-year old mother of Dimitri (7) and Zoë (3), wife to Henk and daughter to Ansie. 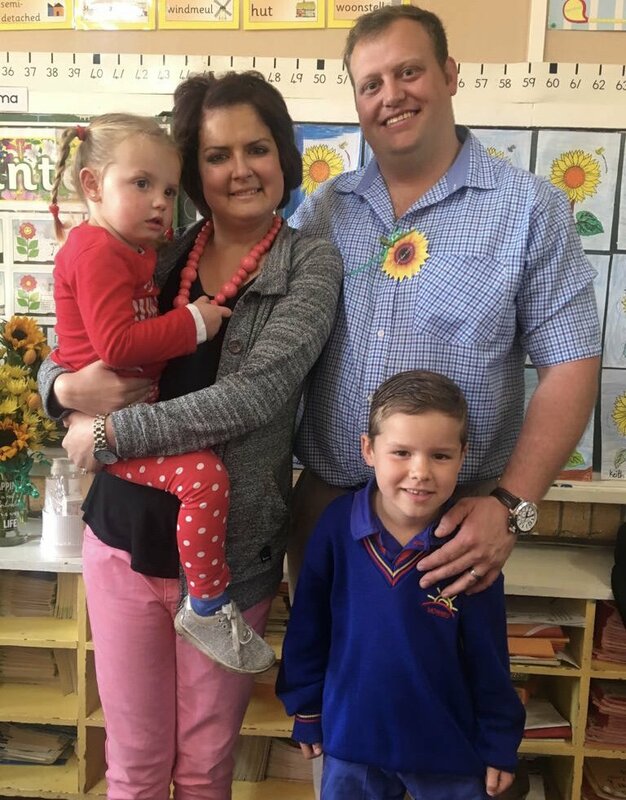 She is also a very special teacher to all the Grade 1 learners in her class at Laerskool Môrewag in Brakpan. In May 2015 - Anerien’s son was just three years old - when she was diagnosed with the devastating Hodgkins Lymphoma. Just five days later, she heard that she was pregnant with Zoë. Due to her pregnancy, Anerien could not get the full chemo treatment. While pregnant and receiving chemo, Anerien’s bother passed away - Zoë was born six weeks early - but Anerien was in remission … cancer came back a year later, a bone marrow transplant followed. Her body rejected the transplant, more scans followed and in June this year, Anerien was diagnosed with lung cancer - and a week ago cancer cells were picked up in her bone marrow. Through all of the illness and chemo, Anerien has stayed positive for her family - as well as her school children. She works as much as she can as their medical aid does not cover all the bills. Her husband, Henk - also a teacher, and her mom Ansie is by her side all the way … but they cannot keep up with the financial strains. That’s where the Angels come in. SPONSORING: Centurion Ladies Golf Club held their annual Women’s Day Charity Golf Day on 9 August 2018. Good Afternoon to all of you Angels! My friend, Anerien Smit is in dire need of help. She is 27 years old, married with two beautiful children aged 7 and 3. She is a fantastic teacher for grade 1’s at Laerskool Morewag in Brakpan. On 15 May 2015 she was diagnosed with Hodgkins Lymphoma, 5 days later she found out she was pregnant with her baby girl. She started chemo in her second trimester and could not get the full dose due to her pregnancy. She had chemo two times a month for six months. In that time her brother passed away and it was a very big shock for her as they were extremely close. Her baby girls were born in 34 weeks. She had then been in remission for 8 months. In August 2016 she had a PET scan done, and the results were worse than they thought. The cancer was back and she had to get more intense chemo treatments which resulted in her to be admitted into the hospital. After the second treatment, there was a 70% improvement and that made us all very hopeful. With the last two treatments, there was no change. That was very upsetting for her and her family. They then changed to a stronger and more expensive treatment, which the medical aid did not pay in full. Her hair started falling out and she had skin blemishes. Her body was in so much pain and strain due to the extensive treatment she got. Luckily she had a port implant because her veins were so weak, they could not even draw blood. In August 2017, she had undergone a bone marrow transplant (her mother was the donor) It was such a struggle going in and out of the hospital, almost every second month. This was because she had no immune system as her bone marrow still had to build up her immune system. You can just imagine how it must have been for them, especially those little kids. In May 2018, she started to become very weak and her skin and eyes became yellow. She was admitted into the hospital where they did a liver biopsy. The results were that she now had host vs graft disease. This happens when her bone marrow cells are fighting the ones from the donor. Due to this, she was booked off work for 3 months, unpaid. In June 2018, she started with sinus problems and very bad coughing. Her doctor prescribed medication after medication. She was then admitted into the hospital in July 2018 as the problem did not change. The doctor decided to do a lung and sinus rinse along with a lung biopsy. At first, they thought she had TB and with the biopsy results, it came that she now has cancer in her lungs. This was such a shock to her and her family. With all the chemo, hospitalizations, tests, scans and bone marrow transplant, they have medical bills of about +- R80 000 outstanding, not even their other obligations like school fees which both children are behind with about R17 000 each. This is not even mentioning the future costs of treatments and hospitalizations. Her husband is also a teacher which means they have minimal income with so much financial needs. Her children are still small and also has so many needs. Anerien is such a selfless and wonderful person, who always puts others needs in front of her own. She is such a fantastic teacher and mother, I can just imagine what she must go thru. She is trying her best to stay positive and be strong. Can you imagine what it must be like knowing that you may die and never see your children grow up and get married? I really wish for her financial burden to be taken away (not only for her but her family), so that she can really enjoy her time with her family and that they can enjoy time with her with no financial worries. Please Angels, can you assist in any way? If I had the finances, I would give her every single cent, but I don’t.